The Hillsborough High School Gymnastics Team was incredibly successful in ending their season as undefeated. The team was led by Coaches Beth Murrin and Sarah Pallay and consisted of Jordyn Bell, Kaitlyn Dundorf, Clare Hanlon, Renee Kinzler, Meghan Kurz, Kayla Kwinta, Cindy Liu, Haley Mandell, Aastha Patel, Shaina Patel, Samantha Ringel, Allison Schmid, Brielle Seidel, Sabina Shah, Jiya Sharma, Sarah Tasetano, Emma Thompson and Tara Vrabel. They won the 2018 Somerset County Championship and Skyland Conference Championship. The Gymnastics Team was also the 2018 Central II Sectional Champions and had a 9-0 regular season record. The senior class team members will graduate with a dual meet record of 38-0. The Gymnastics Team held 4 Somerset County Championship titles, 3 Skyland Conference Championship titles and 4 Central II Sectional Championship titles. 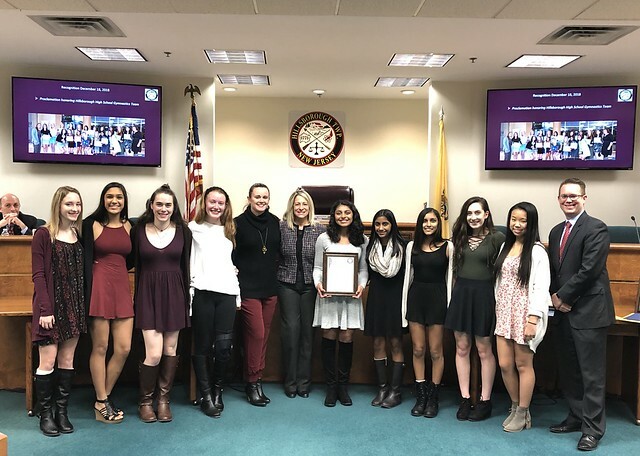 The Hillsborough Township Committee applauds the Hillsborough High School Gymnastics Team for the honor they have brought themselves, their team, and our community through their wonderful achievement of maintaining such a strong record. Hillsborough Township Mayor Gloria McCauley and Deputy Mayor Doug Tomson are joined by members of the Hillsborough High School Gymnastics Team.